As the new diving season is approaching it is important that the maintenance of your scuba equipment is up-to-date and you ensure anything outstanding is dealt with. Your diving cylinder is an essential piece of diving equipment but is often overlooked. 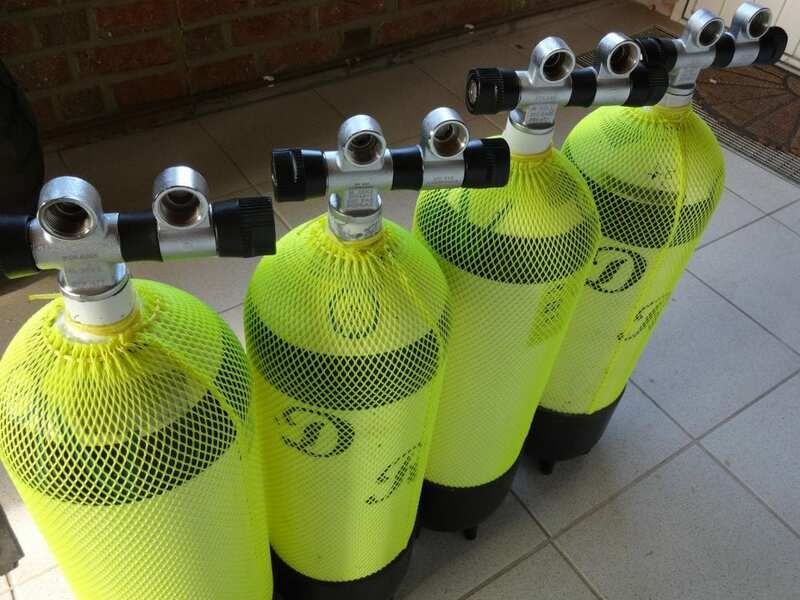 Statutory Regulations require scuba diving cylinders are tested regularly at defined intervals. Cylinders require a visual inspection every 2.5 years from the date of manufacturing or from the previous date stamped on the cylinder. Every 5 years the cylinder needs to be hydrostatically tested (pressure tested) to make sure they are fit for purpose. Not following these regulations is a threat not just to your ability to dive, as refills will be refused by air fill centers, but also to your safety and the safety of those filling your cylinder. Prior to the visual inspection the cylinder is checked for an illegible, incorrect, or unauthorised permanent stamp marking. The procedure for conducting a visual inspection starts with the removal of the cylinder valve. Subsequently the cylinder undergoes an external visual inspection for damage such as dents, cracks, gouges, cuts, bulges, lamination, and excessive wear. When any damage is found it will be evaluated against rejection criteria. The internal visual inspection follows a similar process and is performed using a mirror and illumination to identify damage or defects. The valve and thread of the neck of the cylinder are also inspected for damage or defects. The valve will be stripped down, cleaned, worn parts will be replaced and it is then re-assembled. After the cylinder has passed the visual inspection, the valve will be placed back on the tank and the stamp will be renewed as proof it has passed the test. A hydrostatic test involves pressurising the cylinder with water to its test pressure and measuring its volume before and after the test. Water, which is almost incompressible, is added to the cylinder creating pressure in the bottle and is raised to the test pressure which will be well above the operating pressure of your scuba tank. To measure the change in volume, the whole cylinder is immersed in a test chamber which is also filled with water. This chamber’s water volume is measured with a burette which will show any increase in the cylinder’s volume by forcing more water out of the chamber. An increase above the tolerated level means the cylinder will not pass the test and is permanently disabled from further use. Cylinder servicing can also include Oxygen cleaning for diving on Nitrox and other oxygen enriched gases. You must have this service done at an appropriate service point for the type of diving you are going to be doing. They will ensure the correct greases and cleaning techniques are employed that make oxygen enriched gases safe to use. The tank will also be marked as O2 cleaned so gas filling stations know. “The better the maintenance the longer your equipment will last”. Good maintenance after every drive should be normal practice. Cleaning your cylinder with fresh water and leaving it to dry is as important as safe storage. Unfortunately this is often neglected and corrosion can set in. When storing your tanks you should maintain a slight positive pressure of at least 20 Bar (300 psi) in them. Holding this pressure prevents moist air entering and causing internal corrosion. Finally we recommend storing your cylinders either standing up-right or in a rack. Never store the cylinder on bare concrete or any surface that may hold moisture or scrape and degrade the surface.